Okay, okay. The group was much larger than expected, to our delight, and quite the handful. I had to protect the new Noro sock yarn on more than one occassion. And the Lorna’s? Well, you don’t want to know. 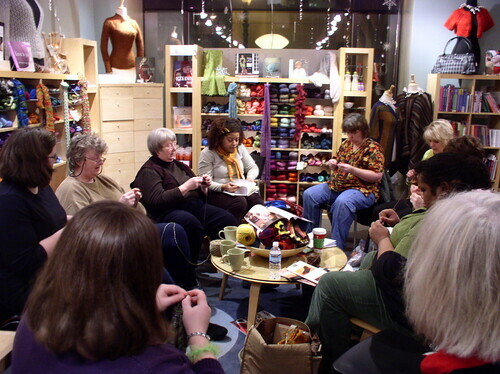 Still, it was fun, and we literally had to kick knitters out to close the shop at 8 pm. I have an inkling we’ll definitely be doing this again after the holidays. Maybe even weekly once I figure this whole organizing thing out. The post turning heels, left and right appeared first on Knit Purl Blog.